What do I get if I purchase the Unlimited Pass? Once you have purchased an Unlimited Pass, you are able to attend as many in-person training sessions with Abilities Network Project ACT as you’d like throughout the year for no additional cost. The pass is applicable to training for the pass holder only and cannot be used to register other people for training sessions. Why should I get an Unlimited Pass? 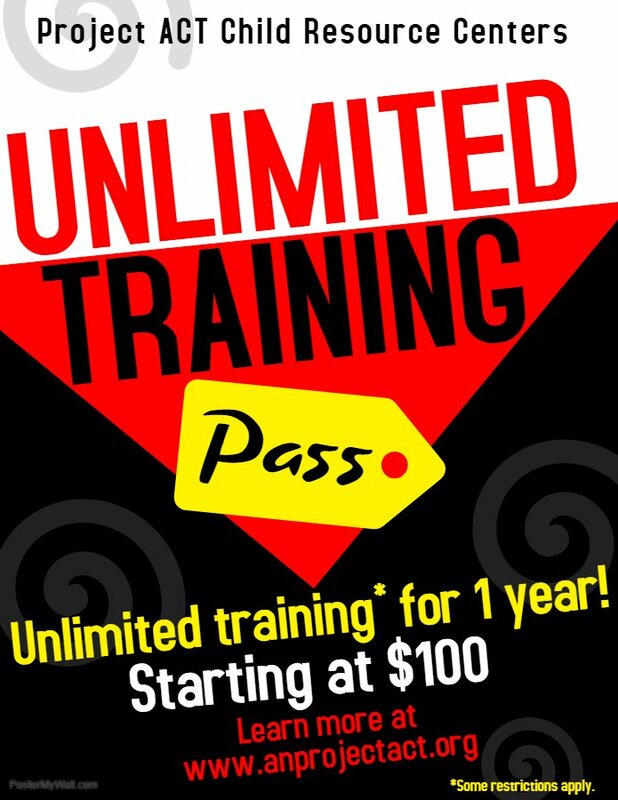 An Unlimited Pass will allow you to attend as many training sessions as you want throughout the year for one low price. You will be able to attend training sessions on a variety of topics based on your interests without being limited by the cost. All training sessions provide COK hours to participants who pass the knowledge measure. Child Care Professionals who are enrolled in the Maryland Child Care Credential Program will benefit from unlimited access to training to meet COK requirements to move up through credentialing levels. If you are starting your own Family Child Care Program, unlimited access to training with the Unlimited Pass will save you money on your start up training requirements! How much does the Unlimited Pass cost? The Unlimited Pass is $120 for non-members, and $100 for members. What is included in my Unlimited Pass? Your Unlimited Pass grants you access to all in-person training sessions offered at Abilities Network Project ACT’s Harford and Baltimore County offices. It also includes trainings hosted at various sites in Cecil County. The Unlimited Pass does NOT include the 2-day Medication Administration class. This class is excluded from the Unlimited Pass at this time. The Unlimited Pass CANNOT be used for on-line training courses through Smart Horizons, or for trainings with any other organizations. How long is my Unlimited Pass good for? Your Unlimited Pass will become active on the day of purchase, and remains active for 1 year from that date. Where can I use my Unlimited Pass? You can use your Unlimited Pass at our Baltimore County office in Towson, at our Harford County office in Abingdon, and at various host sites in Cecil County which are announced throughout the year on our website.